Thanks so much for your god work. Your blog is seeing a lot of exposure on Facebook! Way to go thanks so much for posting! Thank you for this. What was their game plan? 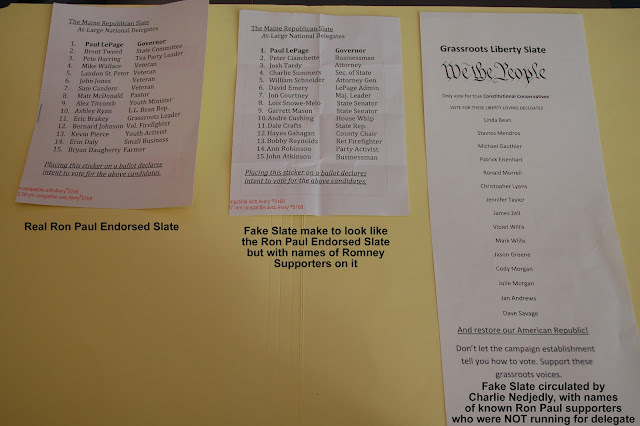 Were they hoping all the Ron Paul delegates that they had on the nomination sheet would decline, therefore leaving only Romney supporters to go to the national convention? The plan was to divide the Paul people. Paul had endorsed a slate of fifteen delegates, and the Paul campaign was INCREDIBLY organized and had all his people voting for that slate (the one stapled into the folder that I showed) Romney also had their own slate. 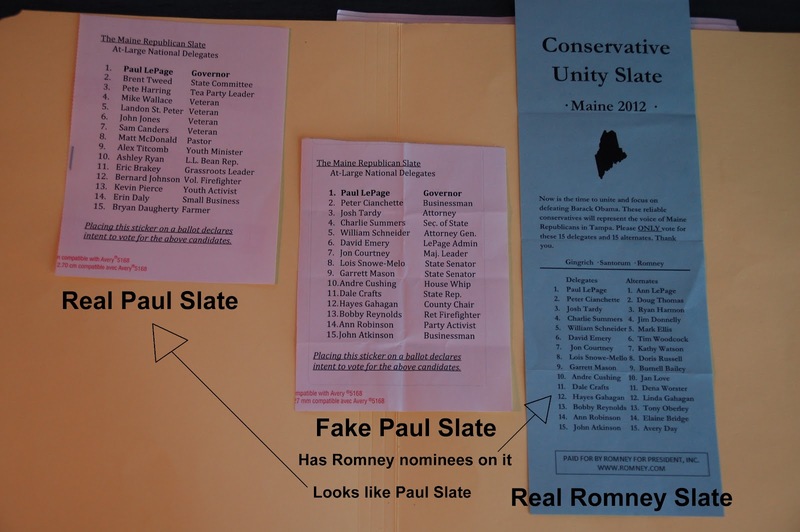 So if they entered the names of 15 Romney candidates, but 30 or so Paul candidates, they were apparently hoping to confuse the Paul people on who they were supposed to vote for. And they used names of people who were alternates, or were running for other seats, I assume thinking that they were high profile people in the Paul campaign, and it would make sense that they were being put up by Paul. I started a new hash tag #CharlieCheater on Twitter to help tie all conversations together about this guy. Use this hash tag to post about this situation at the Main GOP convention to help pull conversations together in hopes that we gain some more information on this persons identity. 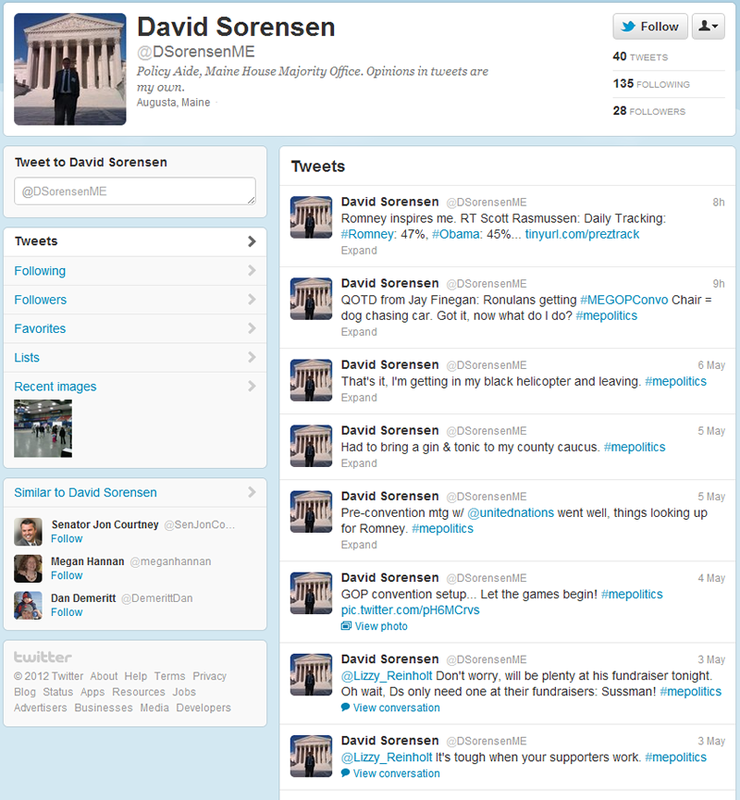 Some followup information on David Sorensen from Lewiston Maine. He appears on the Maine House of Representatives webiste (http://www.maine.gov/legis/house/staffmaj.htm) with a title of POLICY AIDE. He also appears to be current student at the University of Maine School of Law and is featured in a picture on the schools website (http://mainelaw.maine.edu/academics/maine-law-review/law-review-staff.html). Perhaps this can help you confirm his identity. Also his email may be david.sorensen@maine.edu as I've found it posted in a few places around the web if anybody wants to shoot him an e-mail. I was there and lived this absolute nightmare with you guys. I couldn't believe it when I was given the fake ballots, and I watched in confused awe as so many people withdrew nominations. It was amazing that we won, and we did it fairly, which they could not handle. I remember one blonde woman, go ballistic, screaming at the Chair, and then shoot me and my fellow supporters death looks as she stalked by us. It was amusing but scary in a way. Thank you for posting the truth! Cant we please get a conviction. It is a crime to steal someone's identity causing some of these people real trouble. All the other talk seems besides the point. ID this guy - get a conviction. Wow, what a great video update on Charlie. I'm greatly impressed with both your persistence and especially for adding the positive message at the end. One thing the Ron Paul movement has probably been loosing as the campaign has been getting bit more tough in the past few months is humility and in that way is conceeding the moral high ground. Hats off to you for finding Charlie and also for giving such a great wrap up of the whole corruption issue at the Main GOP convention. So, how would we go about filing a criminal complaint against this guy?